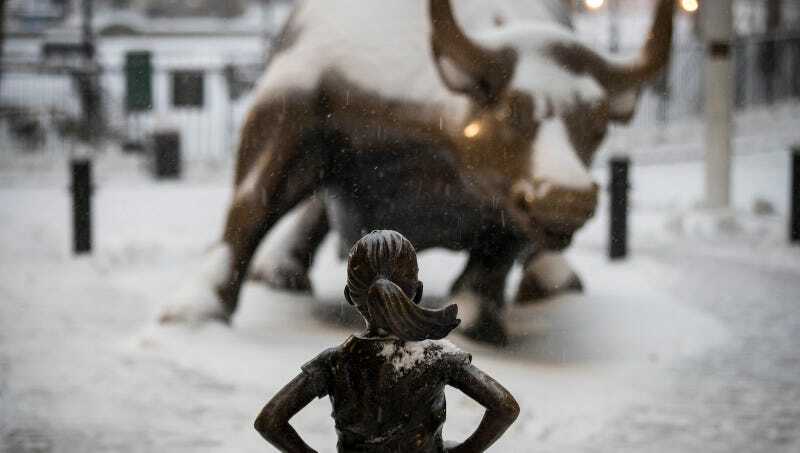 In honor of International Women’s Day, ad agency McCann New York and investment firm State Street Global Advisors placed the Fearless Girl sculpture in Bowling Green Park, facing off with the Wall Street Charging Bull. Like most women figures she’s had to carry a lot of baggage. The tiny bronze statue is now bearing responsibility for pain inflicted on the creator of her nemesis, the Bull. He’s not entirely wrong, but it’s somewhat ironic that Di Modica has a problem with the statue being placed there without going through the proper channels. The Charging Bull was dumped by the artist in front of the the New York Stock Exchange without a permit, following the 1987 stock market crash. The city’s population loved the bull so much that officials agreed to keep it, though it was transferred to its current location. Typical that a girl statue gets criticized for finding success the same way a very masc bull statue did.